You smell that? That smelly smell? More support for Steal Priest, bois, just what I wanted. A small comment regarding her playability - it kinda depends on the opponent you are facing, but overall I'm really impressed by her. If it's a value deck, you could steal its win-condition (Dr. Boom, Mad Genius) and get a huge advantage over the enemy. You will outvalue them. You can also get a copy of a removal (Twisting Nether, Brawl) OR you can copy a burst spell (if you are playing a combo deck and you are in the mirror). And as a bonus, Lazul acts like a small scout. I will totally craft that legendary, if I don't get it from a pack. Will craft, will play, will know what my opponent is holding, will smile. Now this is exactly that: a very good card. So a slightly weaker Operative? Nice. 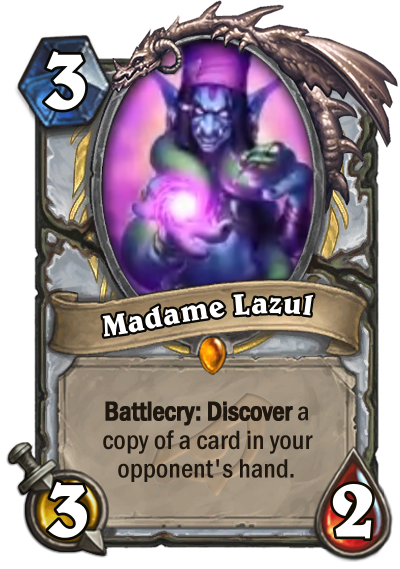 It basically reveals three cards from your opponent's hand. That information can be game-changing. A legendary stream sniper appears! You mean a better chamelos? Which im guessing is rotating out since they made this. Well, it is a value card. It's a case of not being the flashiest legendary they revealed, but still, it's power comes in it's practicality. A card that replaces itself and gives information about your opponent's gameplay/ potential to sabotage it with there own card. I like the card a lot personally. Also, just for the meme brewing, imagine playing this and having spirit of the dead out on the battlefield (more realistically seancing it, but still). Looks like Curious Glimmerroot and Chameleos had a baby. Good card, hope it doesn't end up like Chameleos. Lazul does look slightly better. A Good Card. But why are the Legendaries just "copies" of old effects. This card gets a big jump on Chameleos by being fast, acting immediately and with a (slightly weak) body rather than needing a turn to start spying. True, the lizard could do a lot of snitching, but being able to play Madame Lazul with virtually no setup and no real commitment is incredible. I predict that this card has a very bright future indeed. Side Note: I voted “very good” because there is no “this will be in every deck” button. This card won’t define the meta, per se, but it’ll be like The Lich King or Zilliax, where it’s just generally useful. What’s awesome is that Whispers was filled with these kinds of cards, so that’s a cool indirect throwback.